What a comfort it is to know we are being watched over, and our angel blessings picture frames will remind your guests of your special day. 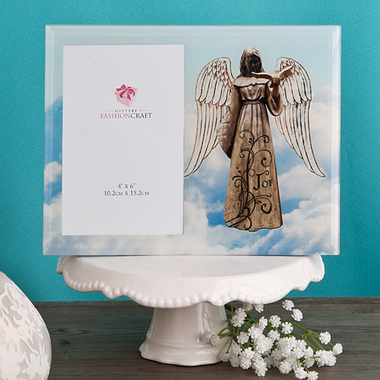 These are lovely gifts for religious occasions! These frames are beveled edge glass construction and will hold 4" x 6" photo on the right side. The left hand side presents a magnificent angel standing among the clouds. Each frame measures 8 5/8" x 6 5/8" and has a black velvet easel back, hinged for easy insertion of photo or other insert. Each will arrive individually packaged in a white box.